The issues have shifted from Why would anyone want to live tiny? To I want to live tiny, but how? There are dedicated people and organizations who have devoted their time to furthering legislation to make tiny living legal in all 50 states, but we aren’t there yet. So research remains your best tool. We aren’t your local municipality or state government so it is important to know your zoning and coding restrictions and regulations. 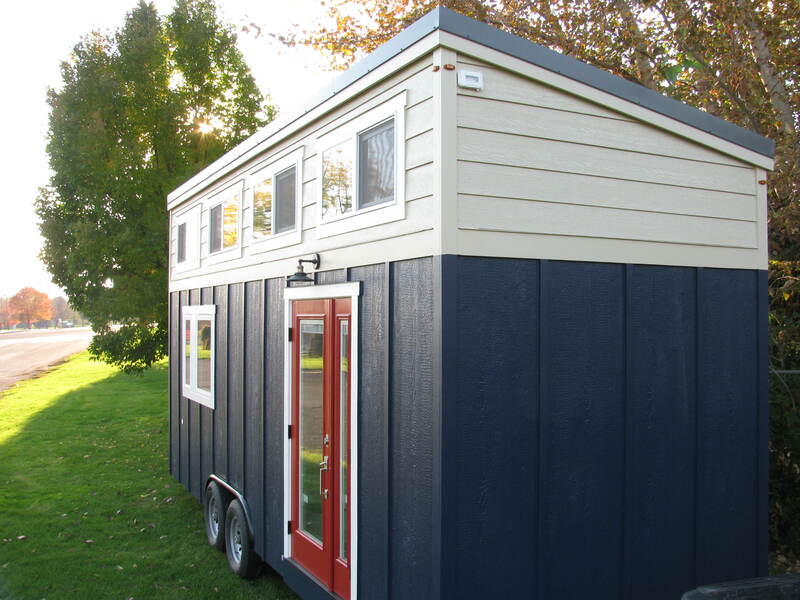 If you are one of those who are sold out for tiny life but feel held back by parking restrictions and state by state illegalities, here are four options for parking your tiny home. Tiny house communities are becoming more common across the United States as those pioneers of the tiny house movement continue to push for the legislature to legalize tiny homes. These communities are hosted by a diverse group of landowners who lease spaces–some full-hook-ups and some boondocking–to tiny house owners. Many are designed like a typical campground, though most are focused on sustainability so they may have a shared spaces such as a garden. Others are more wooded and offer much more privacy and seclusion than a typical RV park. Not all tiny house communities are RV friendly much like not all RV parks are tiny house friendly. However, legally, if your tiny home has been built by a manufacturer who certifies them with an RV or RVIA certification, an RV campground should be an option for you. There are, however, other stipulations to research such as your size. For instance, most national parks will not allow any rig to park overnight if its length exceeds 42 feet. This can be shaky ground, so tread lightly and do your due diligence with researching your local area. Every municipality is different. However, many people are parking in a friend’s back yard, or renting a spot from someone looking for extra income. While the situation may not be permanent if local officials decide to make an issue, this kind of space can be a great option for an extended period of time. In states that frown upon tiny houses, folks get around that by parking on land that is zoned agricultural. Because many farmers hire seasonal help who might pull and RV or have small campsites or cabins for them, not much has been said to disrupt these more full-time parkers. So the answer here is clear: Do Your Research. Start at the top within your municipality and ask questions. Otherwise, check out the other options for where to park your tiny. Anyone who lives tiny will always tell you that parking is the biggest fear for potential buyers. 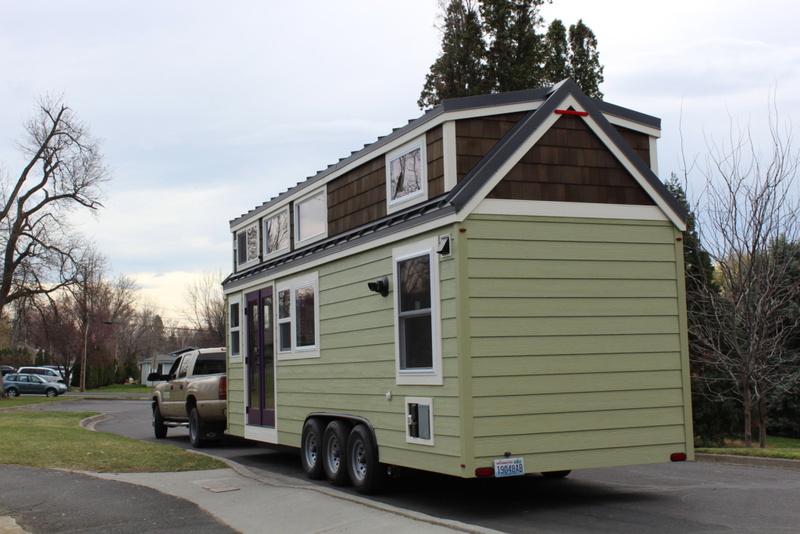 However, they will also attest that they know very few folks who have been asked to move their tiny house. As long as you do your research, and be mindful of your location, living tiny can be the dream you’ve always hoped it would be for you. Please note that nothing in this article should be construed as legal advice. Because every municipality is different, it is critical that you do your own research and make your own decisions about parking a tiny house. You can check out the full list of the top 40 Seattle YouTube channels at Feedspot’s blog. And, take a moment to visit Seattle Tiny Homes’ YouTube channel for the latest videos. You’ll want to subscribe to our channel while you’re there. Thanks for checking it out! When we began building our tiny homes, we were faced with two options: buy third-party manufactured cabinets, like some of our competitors do, or craft our own to suit the unique demands of our clients and the special constraints of a tiny home. We chose the second option. Though this arrangement demands much more talent, planning, and labor, we are confident you’ll love the results and agree that we made the right choice! 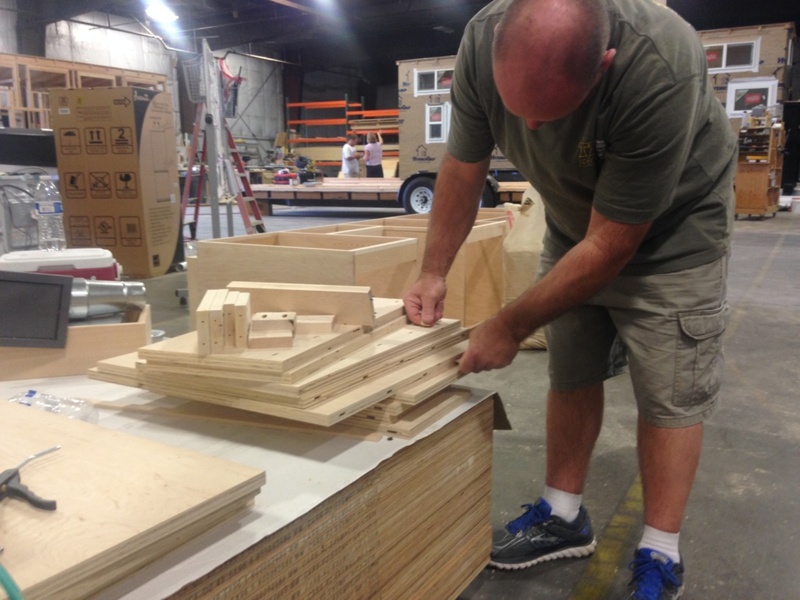 Seattle Tiny Homes cabinets begin with top quality three-quarter-inch plywood, constructed to the highest standards. Many cabinets available today are made with cheap chipboard and entry-level hardware. In contrast, we construct all our cabinets from highly durable, lightweight, and non-toxic three-quarter-inch maple plywood. Cabinet joints are fitted with glue and dowel construction, which ensures a tight and sturdy product built to last a lifetime through the rigors of daily use and road travel. For internal hardware, our cabinets boast high-end Blum door hinges and drawer rails. These hinges and rails self-close, keeping drawers and doors shut and their contents in place as your tiny home joggles down the road. The drawer rails are rated to hold 100 lbs. when fully extended, so you’ll be able to load them up with peace of mind. 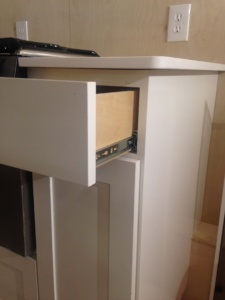 Our cabinets feature space-saving European design and high end touches like Blum drawer rails. You’re Unique . . . So Your Cabinets Should be Too! Since you will be the one living in the tiny home, we believe it is only natural that you should have a say in how you want the cabinets to be. How much storage space do you want? Where should the cabinets sit on the floor plan? How will they look on the outside (color, handles, arrangement)? You decide. No two finished homes of ours are the same simply because none of our clients are the same. 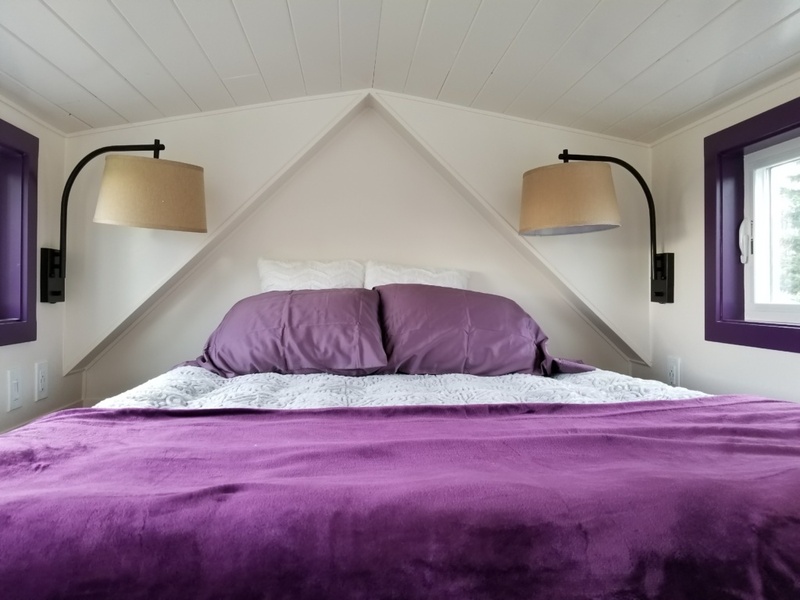 Ray, our experienced cabinetmaker, together with other partners on our team who are experienced in tiny home interior design, will help you get the most out of the space in your home while making it look great too. 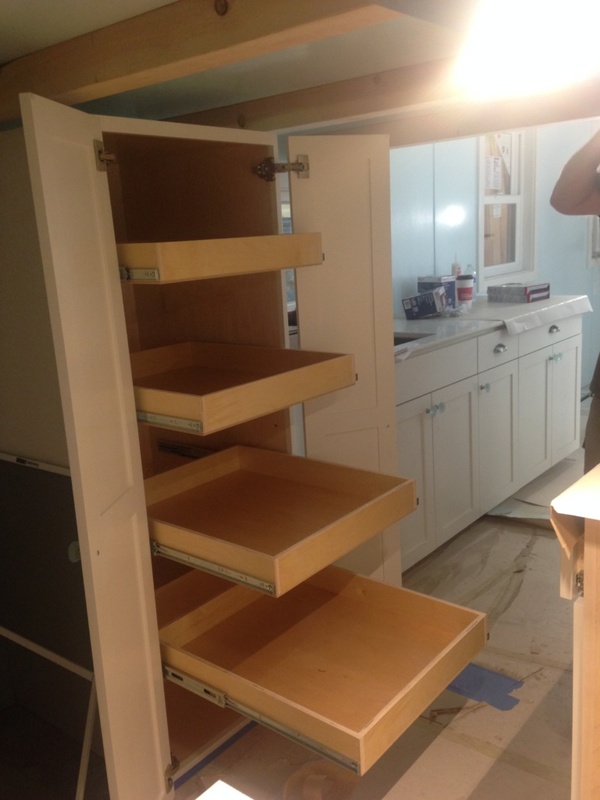 We know how to fit cabinets over the wheel wells, under the stairs, and even under the fridge! “We had complete control over every square inch of the cabinetry. The only restrictions were the size of the kitchen, standard heights/widths, allowances for the wheel wells, etc. It was like having a blank canvas, which is great since Mark is a very talented chef and heavily uses the kitchen…. Our goal was to be able to keep as much of his cooking equipment as possible, while also creating space to store pantry items…. When every square inch counts, you need cabinets designed to meet your unique needs! As you use our cabinets, something you will experience from your first day in your tiny home is their optimal space and functionality. We use a European design, which means no space-eating face frames or interior bracing. The result is drawers that are all inches wider and deeper than the standard layout would allow. You’ll appreciate this extra square inches, which quickly adds up across the kitchen, pantry, and bathroom. But that’s not all…. Under-counter cutting boards in the kitchen can be pulled out for temporary counter-top expansion. We also like to include pullout platforms for your favorite appliances. When your coffee maker, blender, and mixer are on a dedicated pullout platform, they can stay plugged in but off the counter and neatly out of the way when not in use. This clutter-reducing trick both aesthetically and practically simplifies your life, and exemplifies our commitment to simple, mindful living. “We had thought that going “tiny” would mean we would need to adjust to a sub-par cooking/kitchen experience since we would have to sacrifice in terms of space and functionality; however, we have been able to step up our game in the kitchen! We have such a well-designed space and extremely functional cabinets/storage, that we haven’t sacrificed at all and consider our current situation a total upgrade to the kitchens we’ve experienced in our past. Whatever your reasons for choosing a tiny home, you’ll love the way you can customize its storage space to suit your unique needs. Not only will you own a functional, durable product, but one that is beautiful as well. Get in touch today and ask how we can help you design and build the cabinets in the tiny home of your dreams! People have been asking us for a long time if we sell tiny house building plans. Meeting that need is something we’ve always wanted to do, but we felt it was important to wait until we had something truly unique and valuable to offer the tiny house community. We are thrilled to announce that Seattle Tiny Homes is now offering comprehensive building plans! They are based on our most popular model – the Alki – and we believe these are the most comprehensive tiny house plans available today for do-it-yourself builders. To bring the plans to life, we collaborated with Saul Rip Hansen, the founder of the Collaborative Tiny House project. An experienced architectural designer who is passionate about tiny houses, Saul pushed architectural design tools to the limit to produce plans that are intricately detailed yet easy to understand. 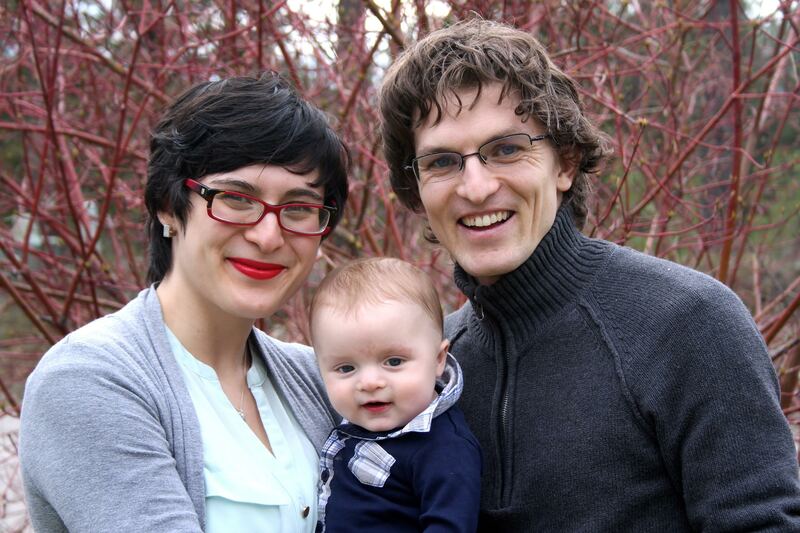 Saul Rip Hansen, architectural designer and tiny house expert, with his family. 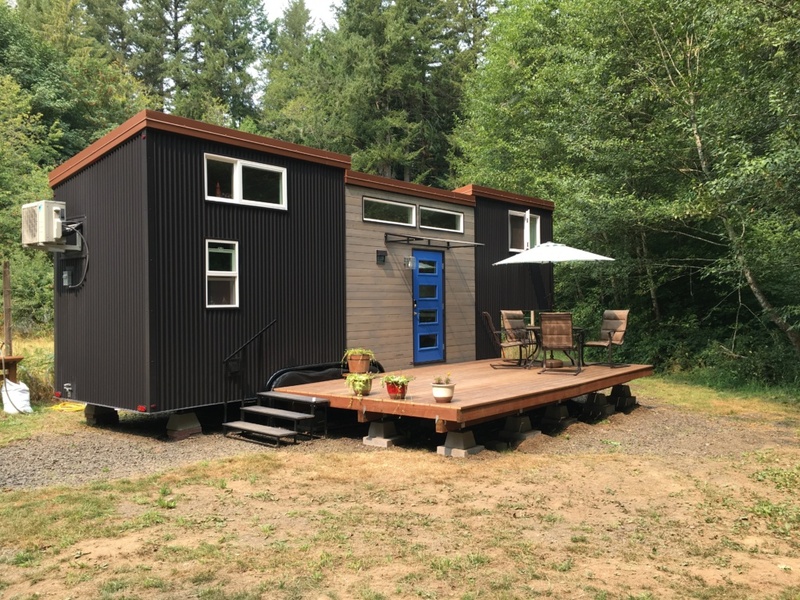 As we talked to tiny house do-it-yourself builders over the years, one thing became clear: complicated systems like plumbing and technical details like affixing the house frame to the trailer are the biggest barriers to successfully building your own tiny home. 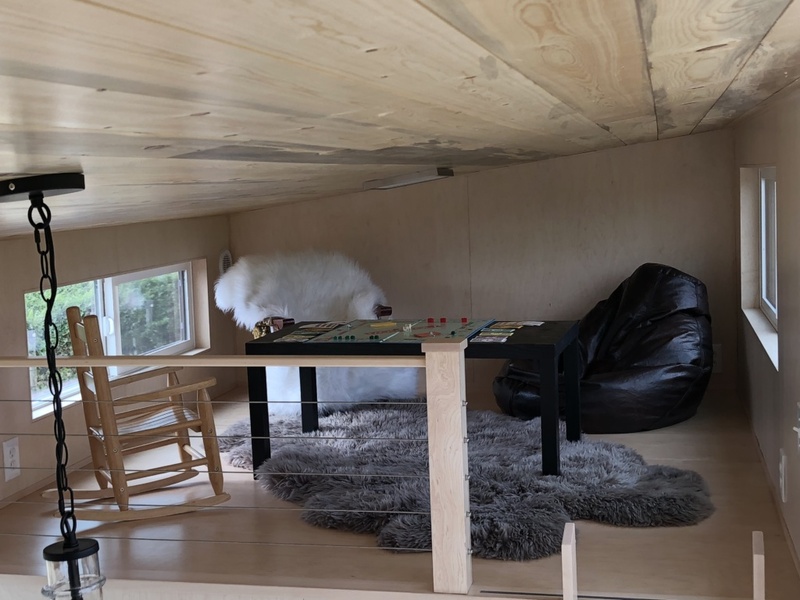 Our professional building team at Seattle Tiny Homes has spent years solving these challenges. And now we’re sharing everything we’ve learned in these plans. Our complete set of plans – over 80 pages long – shows you how to frame your home and securely fasten the frame to the trailer. It includes comprehensive plans for all your home’s most complicated systems: electrical, plumbing, propane, and HVAC. We’ve even included a step-by-step building guide so you always know what to do next. If you don’t need the complete set of plans, you can purchase different system modules individually. For example, you can purchase just the electrical plan . . . or the plumbing plan . . . whatever systems you need. Each module is extremely detailed and includes a list of tools needed, a materials list, schematics, cutaways, perspectives and pro tips. We truly believe these plans give you the best possible opportunity to succeed. The 24-foot Alki is just the right blend of space and efficiency. The Alki has a full kitchen, a full bathroom, and even space for a washer and dryer. Sleep in one of the two lofts or a convertible bed on the main level. It is one of our most versatile and practical models. With clean, contemporary styling, the Alki is eye-catching and beautiful. We believe you’ll love it just as much as we do. Check out our new plans now! Thank you for your support.